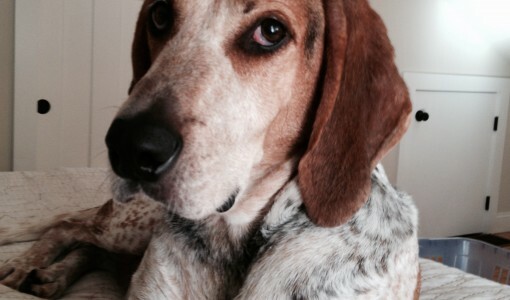 Moments after Kris, a coonhound, arrived at Foster Hospital for Small Animals at Cummings School of Veterinary Medicine, his heart –stopped and he flat-lined. A few days later, Kris left the facility, alive and well. What happened in between was a credit to the determined, united efforts of the veterinary team, some fortunate timing, and the power of CPR, IV fluids, blood transfusions and emergency surgery. Only the day before the life-and-death battle, life was moving along routinely for Kris and his owner, Keith Pellerin of Northborough, Mass. But the next morning, family members noticed Kris didn’t look right. He was “just laying there,’’ with no energy. The family took him to his veterinarian who determined that Kris’ “belly was loaded with blood.’’ Kris was rushed to Foster Hospital, where he was immediately rushed to the emergency treatment area. That’s when he “officially died”. The Emergency and Critical Care team instantly went into life-saving mode. Dr. Claire Sharp, BVMS, MS, DACVECC, and the rest of the emergency services care team performed CPR on Kris, who also received large volumes of fluids and blood transfusions intravenously. Within 20 minutes and the Foster team revived Kris and he was stable enough to be rushed to surgery. The surgeon, Dr. Abigail Mariano, determined that Kris was bleeding from a mass on his spleen, which had burst. The massive blood loss was what had caused him to die. In surgery, Dr. Mariano immediately put a clamp on the vessels leading to the spleen, to stop the bleeding. “From there, everyone could breathe just a litter easier,’’ she said. When the crisis eased, she was able to remove his spleen. The mass was sent for testing to determine if it was cancer. Kris faced long odds. He had about a 70 percent chance of a cancer diagnosis. His family rejoiced to learn the tumor was benign. However, Kris still faced a tough road ahead – he required intensive care for post-operative issues associated with his serious condition. During his time in the critical care unit at Foster Hospital, Kris had very severe heart problems, a consequence of his heart having stopped and the subsequent CPR. Fortunately, with intensive management by the ICU and cardiology teams, they were able to get his abnormal heart rhythms under control too and Kris was sent home from the hospital five days later. Kris is a fighter. But then, beating the odds comes naturally to Kris. “He was a miracle dog from day one,’’ Pellerin said. Pellerin adopted him after a client at his store mentioned she was transporting her dog to a local shelter because she could no longer care for him. Today, Kris is better than ever, Pellerin reports. “He runs faster, jumps higher,’’ he said.